Well, my friends, I finally did it. I took the plunge and wrote out a menu plan for the entire month of September, plus the days before and after, to make it a full 5 weeks. I even typed it out for y'all. I did it, but I'm still not convinced it was a good idea. On the plus side, I'm not going to have to come up with ideas for meals for at least 5 weeks. Plus, I can save this calendar and use it over and over again. On the minus side, I've already had to make changes and it's only the 2nd day of the planned meals. I can plan around our crazy sports/Scouts/church schedule, but the Hubby's work schedule is ... shall we say ... unpredictable. There's also my insane innate need for variety. I keep telling myself it's easier to revise than create, that it's not set in stone. I think part of my issue, honestly, is that if I'm going to put in the effort to plan a month's worth of meals at one time, I want it to be set in stone. I don't want there to be changes. I don't want to have to revise and rearrange. I want to be able to just do this once and be done and not have to think about it again for another 5 weeks. In the meantime, school starts tomorrow. Nope, not ready. You? And here's the current menu for the rest of September (and beyond). If you care to, you can come back and compare my weekly menu posts. That would be kind geeky of you, but I won't judge. Here's why I love this granola. I mean, besides the fact that it's a delicious crunchy concoction of whole grains and healthy fats with just the perfect touch of sweetness. Which it totally is. I love that it's completely customizable. If you don't like one of the ingredients, leave it out. Add in things you love. Use a different sweetener. Just make sure you keep the ratio of wet to dry ingredients about the same. Personally, I haven't added the sesame seeds to this recipe in years (although I did find some in the cupboard and I was totally going to put them in this last time, but I forgot). Lately I've been adding pepitas in their place. I've also added chopped almonds and chopped pecans to the mix. I regularly substitute ground flax seed for the wheat germ. 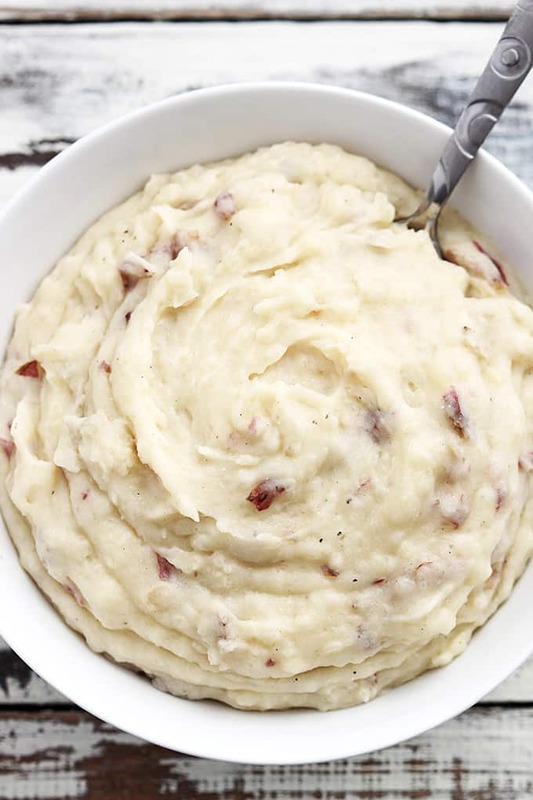 I've shared this recipe before, but it's buried at the end of a post, and isn't very easy to find unless you know exactly what to search for (earth day and medication, of all things... Don't believe me? Try it. ), so here it is again. In a medium saucepan, mix wet ingredients and bring to a boil over medium-high heat. Pour honey mixture over dry ingredients and stir until evenly distributed. Spread on 2 large rimmed baking sheets. Bake at 325 for 5 minutes, then stir, bake for 5 minutes, then stir, bake for 3 minutes, then stir, bake for 3 minutes. I love to sprinkle this granola on top of my yogurt and strawberries. Sweet, tart, and crunch all in one bowl. So good! The boys eat it the way they'd eat any cereal. With milk. Or ... without milk. I buy a lot of my ingredients in the bulk aisle of my grocery store. That way I can buy the exact amount I need for the recipe. Measure the oil (I like using coconut oil) first, then measure the honey in the same measuring cup. The honey will slip right out. If it is humid when you make this granola, it might not get crunchy. If it's a little soggy for your liking, just pop it back in the oven for a few minutes to crisp it up. It helps to store it in an airtight container, as well. I'm a little later this week on the garden update, but that's just because not much has changed. Also? It took me a while to get outside with a camera. Also also? We have a no electronics between 9 a.m. and 4 p.m. policy. I'm sneaking in some time on the laptop right now. Don't tell the kids. It took me a while to get outside with the camera because in this, the last week of "summer," we've been attempting to fit in all the things we didn't get to earlier on when we were stuck in our pack-go-return-unpack-wash laundry-pack again rut. 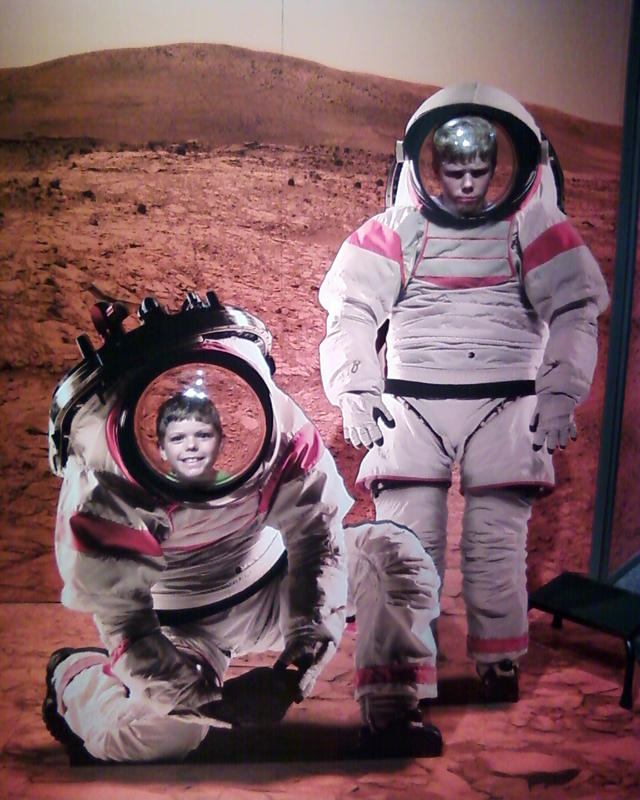 Yesterday we went to Mars. As you can see, one of my children was happy to be there. If we did colonize Mars, we would have to grow food there. So good thing we've been practicing down here on Earth. Bubby harvested our first carrot the other day. Unfortunately, I didn't have the heart to thin the carrots after they germinated, so this might also be our only carrot. We'll see. There are a couple others that might get big enough to make them worthwhile to eat. Notice he's in his top secret ninja gear. Because you have to sneak up on the carrots. Here's our itty bitty watermelon--it's about the size of a garbanzo bean. I have little faith that this melon will grow enough to harvest and eat before the cold kills its vine. You never know, though. The spaghetti squash that was about 2 inches long 2 weeks ago is now fully grown, at about 11 inches. 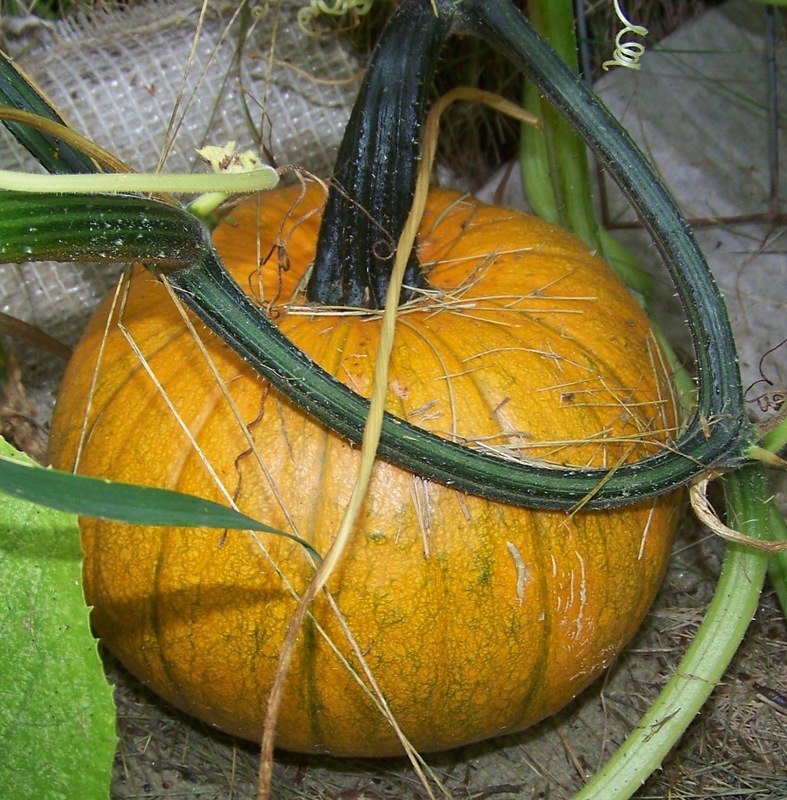 The pumpkins continue to turn orange. I'm really looking forward to having canned pumpkin to use over the winter. My tomatoes are having issues. There are plenty of green tomatoes, but I just noticed brown spots on a bunch of them. Not sure what's going on. I'm hoping to get another canner load before the end of the season. In other news, this is Star, our monarch. We raised her from an itty bitty caterpillar, and now she's off in the world. This is our super easy DIY composter (read more about how to make one here). AKD made it for me (but hasn't quite finished). And there's dirt in it! Yes, I made dirt. In a garbage can. So exciting. Well, as exciting as the natural process of decay can be... Yes, my friends, I have found a way to harness the power of entropy. Finally, entropy is on my side. Remember last week when I told you I had a list of some of the oddly shaped frozen things that don't stack nicely in my freezer and take up a lot of room to try to use up this week? Here's the resulting menu. I'm happy to report that I'm way ahead of myself this school year, at least in one area: the first day of school treat. That's right, folks. I already know what the first day of school treat will be, and I've already made half of it. This is something that doesn't usually happen until...oh...about 2 hours before the first kids come home on the first day of school. Aren't you just insanely proud of me? Yeah. Didn't think so. Whatever. Thought I'd share, just in case you're not as on top of things as me (see that? That's my tongue planted firmly in my cheek. Anyway...). I was inspired by this, found in an image search. I borrowed it, added some text, et voila! 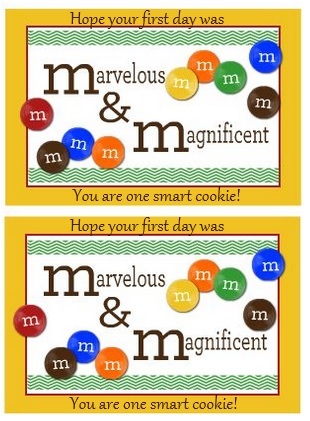 A cute little tag to attach to a bag or box of m&ms candies. 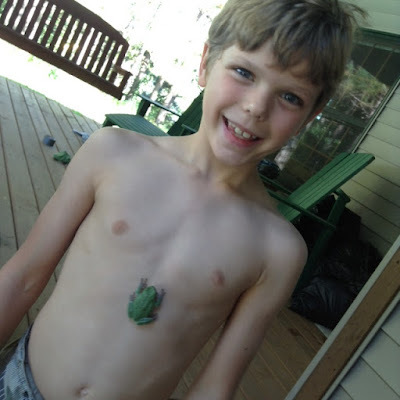 Adorable, right? to attach to m&m cookies. It's not too much is it? Over the top? Mixing metaphors or puns or something? Is it presumptuous to say they're smart cookies already on the first day? Thank goodness I still have a little over a week to ruminate and ponder and contemplate and fixate on this question (there goes my tongue in my cheek again). 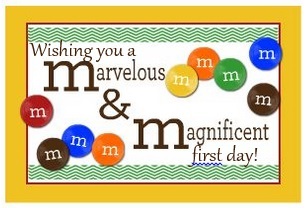 Do you have any first day of school traditions? Please share in the comments. For more back to school treat ideas, check out Back to School Sweet Treats, Back to School Apple Treats, and A Few Punny Back to School Treats. For a fun and super easy non-food back to school teacher gift, check out Meet the reMARK(ER)able Teacher (easy teacher gift) and Another punny teacher gift. Yesterday I promised I'd keep you posted on the freezer issue, so here ya go. I went through and organized both freezers (the "starter" freezer and the freezer attached to our fridge) yesterday, and found a little bit of room, enough that I felt comfortable going ahead with my plan to make large batches of meat sauce and taco seasoned meat for the freezer, but not enough room to commence the long list of baking projects. I have a list of some of the oddly shaped frozen things that don't stack nicely and take up a lot of room to try to use up next week, and then, hopefully, I'll be able to bake the 1st week of school. I realized that, even though spaghetti with meat sauce usually shows up on our menu 3 or 4 times a month, I've never shared my recipe. 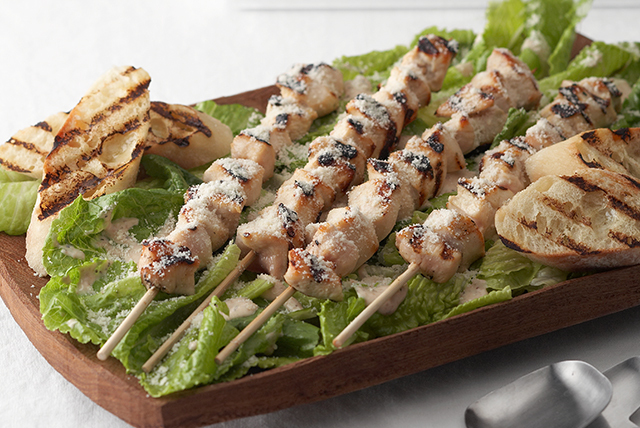 It's a very easy, delicious recipe that uses just a few pantry staples. And you can control what goes in it. Win. I like to sextuple this recipe, then when it cools, I ladle meal sized portions into quart size freezer bags, freeze them flat, and store them like file folders in the freezer. Having this meat sauce in the freezer makes it so easy to whip together supper on nights when I'm squeezed for time. 1 pound lean ground beef or other meat--I use a combination of lean beef and turkey, but use whatever you have. You could even substitute lentils or beans. In a large skillet, cook ground beef, onion, and garlic, stirring occasionally, until beef is cooked through. Drain. Heat to boiling; reduce heat. Cover and simmer for about an hour, stirring occasionally. You guys! I rearranged my freezer and now there's even less room. Yikes! How did that happen? Usually when I rearrange I find more room. Now I really don't have room for stocking the freezer with quick and healthy snack and meal options. And I already purchased ingredients and thawed out my eggs for today's planned baking day. Yes, you heard me, I thawed my eggs. Wanna make something of it? And then I found more eggs in the fridge (Hubby told me we were out, and I believed him). If I hadn't had to find those frozen eggs, I wouldn't have taken everything out of the freezer, and if I hadn't taken everything out of the freezer, I wouldn't have had to put it all back in, and if I hadn't had to put it all back in, I would still have room for the baked goods that I was planning on making today. Someone needs to start eating that fish before I decide to kick it out and dedicate its space to granola bars. Blessed beyond measure. That's what I am. I'll make another attempt at the freezer later today, and I'll keep you posted. In the meantime, this development has left me without firm plans for the day. Hmm. Whatever shall I do? Three of my pumpkins are turning orange. So exciting. I think I'm supposed to wait until the vines die to harvest, but I'm not sure. Must research. This is the honeydew melon that was gnawed upon. It's still growing, and it looks like the rind will just scar in those gnawed parts, leaving the inside to develop into sweet green melon goodness. This is still my biggest melon, and therefore my best chance at eating melon that I've grown, so I'm just going to let it grow. 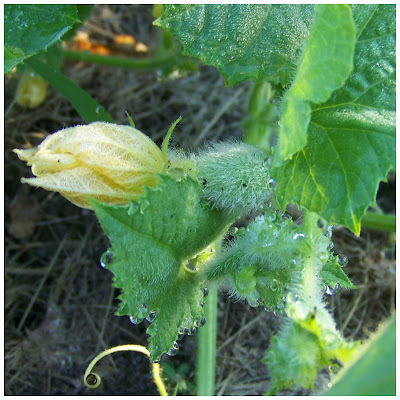 Speaking of melons, I finally spotted a female watermelon flower yesterday and promptly pollinated it. Yay! So now there's at least a chance of getting fruit. I have a long (20 years+) history of not-successfully-growing watermelon. I'd like to break that streak. I picked a couple of cucumbers, and a couple more are almost ready. It's looking like, if I do turn them into pickles, it's going to be one jar at a time. Not ideal, but we're not really big pickle eaters anyway, so it's all good. I have another zucchini. It cracks me up how this poor plant only produces one zucchini at a time. It's just doing what it can do in less than ideal circumstances (which is all any of us can do. Lessons from a tomato-crowded zucchini plant). 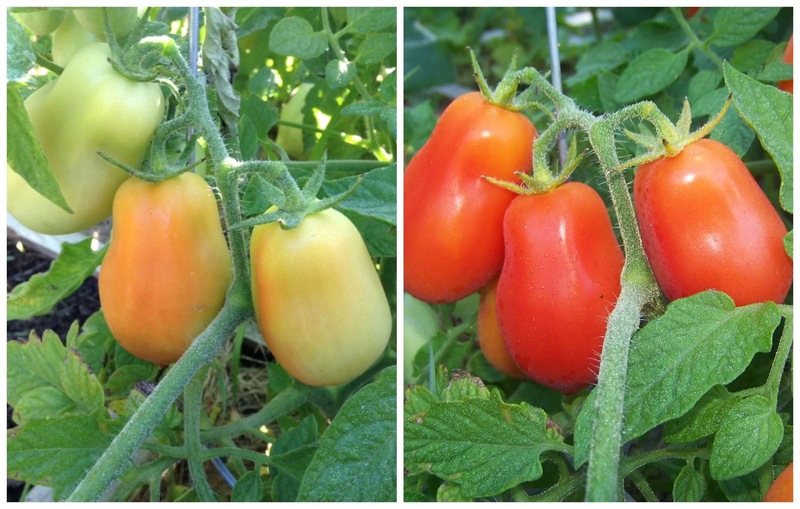 This is what I mean when I say I'm glad that at least some of my produce will turn a color other than green when it matures. 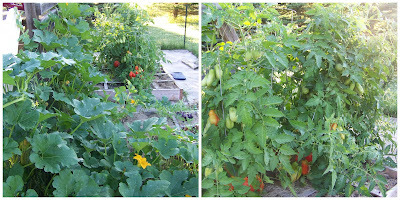 The tomato plants are so lush and thick--the only way I know there are actually fruits in there is when I see a bit of red amid the green. I've been harvesting a couple tomatoes here and there, but not near enough to justify canning. My favorite brother in law's favorite mama, KD, told me that she just peels, cores, and freezes her tomatoes until she gets enough for a canner load, so I thought I would try that as well. Which brings us back to the full freezer issue. Blessed. So abundantly blessed. Did y'all know that school starts in 2 weeks? What happened? No, I'm not ready. No, my kids are not ready. There is a whole lot of unpreparedness going on around here right now. That's ok. We've got 2 weeks. Fourteen days. We can do this. This week, I'm feeling like I want to get some quick and easy breakfast and snack options, as well as some quick suppers, made and stored in the freezer. Unfortunately, the "starter" freezer is full again because I picked up 80 pounds of Zaycon Fresh ground beef (on sale now: beef hot dogs, kielbasa, pork filets, ribs, bacon, sausage, salmon, cod, chicken; use promo code BB1 to save $10 on a $75 or more purchase) on Friday. The thing about my freezer, though, is that I always seem to be able to find a little more room in it. It's kind of like Mary Poppins' bag. But not really. Also unfortunately, because I've been so focused on planning ahead, I haven't really planned for this week. Oh well. Here's what on the menu this week. So, for no other reason than it's Tuesday and I love my garden, it's time for another garden update. I have a gallon-sized bucket sitting on my fireplace just overflowing with gorgeous red tomatoes. These lovelies, which I grew in my garden, and picked this morning, are destined to become salsa, aka summer in a bottle, later this afternoon. I have 4 pumpkins that are close to harvest size--now they need to ripen. Remember, these are pie pumpkins, so they're only about 6-8 pounds at harvest. There are also a few others hanging around, getting bigger. Based on my pumpkin success this year, I may be willing to try jack-o-lantern pumpkins next year. Maybe. 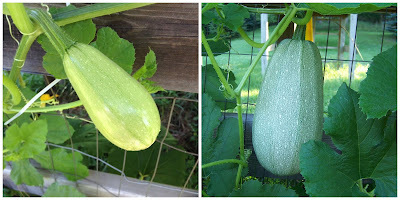 I also have 3 spaghetti squash that are close to harvest size, and just need to ripen. I was really bummed when I stepped out into the garden yesterday and realized that something had been gnawing on my biggest honeydew melon. I'm hoping that whatever it was is a ground-based creature, and it won't be able to reach the melons that are hanging. 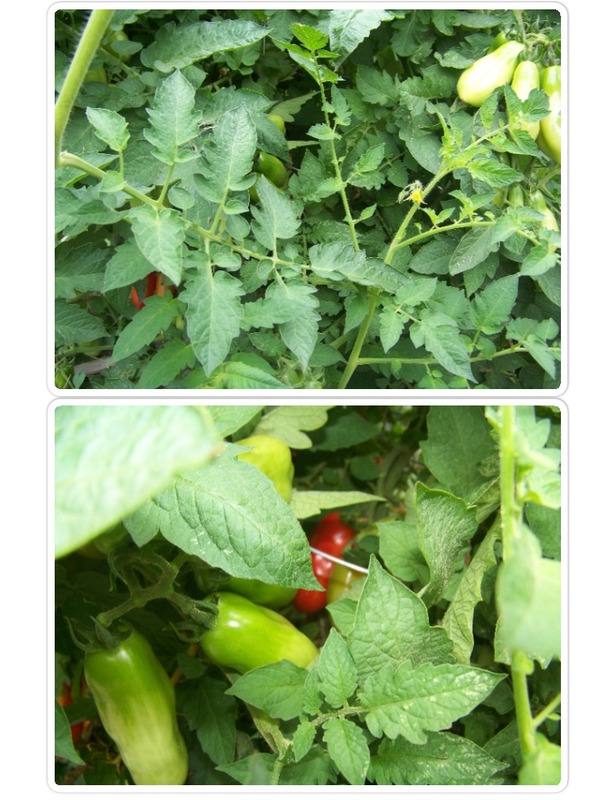 Something has also been eating my tomatoes, ripe and unripe, the silly thing. The tooth marks are similar, so again, hopefully whoever it is won't be able to reach the upper tomatoes. My lettuce has disappeared, but I'm not seeing any chewed on lettuce stumps, so I'm choosing to believe the lettuce was eaten by creatures of a human variety. I'm probably wrong. I harvested my lone zucchini last week, and this morning I saw that another female flower is forming. I'm choosing to see it as a blessing that I'm totally able to keep up with zucchini production this year (especially after finding bags and bags of frozen shredded zucchini from last year in the bottom of my freezer). :) I used about half of my zucchini to make noodles, and I'm planning to slice the other half, and grill it with olive oil, salt and pepper tomorrow night. I picked my first pickling cucumber this morning, but none of the others are even close to harvest. So now I'm a bit concerned about this whole pickle thing. I'm wondering what the absolute minimum batch size is for canning pickles, and if I'll have enough tomatoes ripe at the same time to fill the canner. Still no baby watermelons. The carrots are getting bigger, and I think the grape tomato is just about done. I also have some lemon cucumbers that are just getting started. I'm just back from a whirlwind weekend away. Without the kids. So I'm more focused right now on acclimating back to real life than planning a menu. However, the people around here expect to continue to eat, so here's what I've got. The House That Cleans Itself by Mindy Starns Clark. OK, who am I kidding? I skimmed the book. Because honestly, who has time to read a book about cleaning when the house is just overflowing with entropy? Anyway, I found it interesting. Maybe even helpful. The main premise of the book is that the reason some people can't keep their homes clean is because it's not convenient. For example, I have a friend who piles her dishes up on her counter all day long because it's too much work to open the dishwasher, bend down, pull out the rack, load the dishes in, and close the dishwasher. I'm not poking fun here, because I get it! I soooo get this. I, myself, leave the dishwasher open with the bottom rack pulled out pretty much all day to eliminate that open-the-dishwasher step. So the solution is to make it convenient. Put all the tools you need for a task in the same place where you do the task. Put trash cans where you are generating trash. If you always throw your keys on the counter instead of hanging them on the nifty hook you installed by the door for that purpose, put a basket on the counter for your keys and make that their place. I recently repurposed a trash can to sit by my desk. Yes, there is already a trash can in the bathroom nearby, but that's 10 steps away! And I have to open a cupboard door to get to it! Guess what I was doing with trash that I generated sitting by my desk? Was I walking 10 steps, opening the cupboard, bending down, and putting the trash in? No. I was throwing it on the floor or on my desk with the intention of getting it later. This is how hoarding starts, my friends. The author suggests getting multiples of items that you use for more than one purpose or in more than one place. She says to label them with where they belong, and if necessary, put a leash on them to keep them from walking away--like we did with our dry erase markers in the dorm. We waste so much time just gathering supplies for a task, and for the house-cleaning impaired, those extra minutes are daunting, and might just be enough to keep us from starting the task. Keep bathroom cleaning supplies in each bathroom. Keep kitchen cleaning supplies in the kitchen. I really should have 2 paper shredders: one in the mud room, where I sort the mail, so I can shred junk right away, and one by my desk, where I pay bills and review financial information. Ms. Clark also talks about sight lines. What do you see when you first walk in to a room? That's the area that you for sure want to keep clean and uncluttered. All of that is terrific and inspiring and all, but it's not really what I wanted to talk about. And here I am, how many words later, finally getting to my point? Are you still with me? Anyway, another thing Ms. Clark says is that everyone has an area in their home that, if that area is clean, they feel like their whole house is clean, regardless of how the rest of the house looks. So the trick is to keep that area clean, so you feel less overwhelmed by everything else and are more likely to tackle other areas. So I've been thinking about it. What is the one area in my home that, if it's clean, I feel like the house is clean? I've been trying different areas out. I start with a messy house, which, thanks to my resident purveyors of entropy, is not difficult. Then I clean one area and sit with it for a while, while the rest of the house stays messy/gets messier. I tried the kitchen counters. I tried the living room. I tried the top of the fireplace. I tried the vinyl floor in the kitchen and dining room. I tried my bedroom. I tried the bathrooms. I even tried the mud room, because that's where I most often come in to the house. And I have come to the conclusion, that my area that when-it's-clean-makes-me-feel-like-the-whole-house-is-clean is ... the whole house. Anyway, if you are cleaning impaired, like me, you might want to check out this book. I found it to be inspiring, and worthwhile to at least skim. And you know it works, because who has time to write a book if her house isn't cleaning itself? Again? Another garden update? Didn't we just do this last week? Well, yes, we did, but we need to do it again, because it just changes so fast! First up, this is the spaghetti squash that I shared a picture of in this post. What a difference a week makes! This thing is as big as Bubby's head! It's beginning to pull the vine down, so I made a little sling for this guy. Luckily, Hubby just got home from a mission trip with a couple of T-shirts he's now willing to turn into rags. Or squash supports. This is another spaghetti squash. 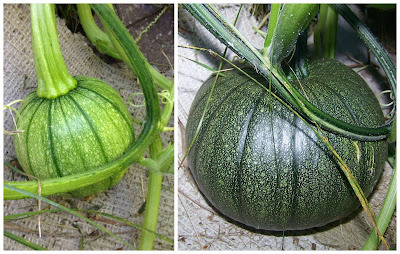 The two don't look a whole lot alike--different shape, different color, which made me wonder if perhaps I managed to get 2 different kinds of squash. A quick search reassured me that this variation is well within the range of normal. This is the pumpkin I showed in my previous post. Speaking of pumpkins, I want a lot of them, so I've been hand pollinating them when I notice an open female flower. Then, as they grow, I take special interest and pride in "my" pumpkins. You know, the ones for which I feel responsible. I note their growth with approval and think to myself, I did that. As if I'm not responsible for the ones who were fertilized naturally. I am not, however, fertilizing spaghetti squash. They seem to be doing quite well on their own, thankyouverymuch. And I don't know how to preserve the squash aside from freezing, and, well, with our "starter" freezer, I just don't have much space to dedicate to squash (the pumpkin, I'm planning to can). Several of the tomatoes are just about ready, and none too soon--we just opened our last jar of salsa! On the left, one week ago. We have a couple of tiny honeydew melons, and I have to say, I am so excited about this! I think honeydew is my favorite kind of melon, and to grow my own would just be so sweet. Literally. No watermelons yet, and it's probably too late for them to mature before frost, even if they did set fruit tomorrow. But maybe? Who knows? I will be out there with my paintbrush when those female flowers appear. I hand-pollinated this honeydew yesterday. I have lots of little pickling cucumbers, so it looks like Bubby will get his pickles. Life started out rough for this valiant zucchini plant, when it was the only one of its brethren to even germinate. Now the poor thing is totally being crowded by the tomato plants, who are staging a coup to take over the garden (see photo above), knocking over their supports left and right (but mostly backwards, toward the zucchini). The pumpkins and the surprising out-of-nowhere contender spaghetti squash (see other photo above) are giving the tomatoes a run for their money, though. ...and I couldn't pull our the weed before I took the picture?! The zucchini plant has one lonely squash on it, so I guess I'm going to miss national sneak zucchini onto your neighbor's porch day again. I've pulled out all the green beans and the lettuce square that was planted first. And that's what's happening in the garden. August already! That means there are only 4 more weeks left of our "summer" "vacation." We've had some hot and humid days lately, and I've heard more than one radio announcer tell me that if I'm feeling too hot, I should just think about those cold days of winter and then I won't mind as much. They're wrong. I love fall. Mostly because it means the hot is over. I love winter because of the snow. And, lucky for me, one of those radio announcers also told me to expect higher than average snowfall this winter. I'm waiting on the woolly bears to confirm. Hubby and I are celebrating our 20th wedding anniversary this week with a quick weekend trip. Without the kids. A dear friend and her family are hanging out with our kids while we're gone, and we are so thankful for their kindness. They're even going to feed the children, so that's good. So y'all know I was taking care of chickens this week, and I really enjoyed getting to know the girls. One day this week, after I let them out, Mr. Rooster was strutting around the area with about half a dozen of his hen-harem following him around. And I do mean strutting. He was proud: head up, chest out, crowing to his groupies. Ever heard of an extremely confident person being described as "cocky"? Well, now I know why. Totally made my day to see him protecting his girls like that, and them following him wherever he went. In other chicken news, there is a sheet and a mattress pad hung up between the people part and the chicken part of the coop, for separation, as well as insulation. 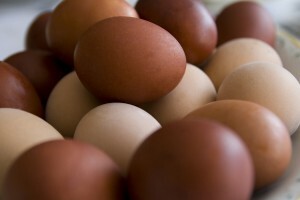 And every day, when I pulled aside the sheet to go in and collect eggs, one beautiful brown egg rolled out. Yes, one of the girls likes to lay in the cozy privacy afforded by the divider. And I can't say I blame her. All of the actual nest boxes, where the eggs are supposed to be laid, are exposed. If I was going to lay an egg, I would definitely want a little privacy. Cracked me up to see that egg roll out every day, though. And it also cracks me up to say that something about eggs cracks me up. Ha! Our neighbors have a lawn service. The other day, as I was driving past, I noticed the freshly cut grass and the enclosed trailer of the lawn service in the driveway, and I thought, oh, how nice, their grass got cut--looks good. But I happened to glance in the trailer as I passed, and there was the mower, in the trailer, with the guy just sitting there, taking a little break. On the mower. In the trailer. I guess you had to be there, but it made me smile. Of course, my garden makes me smile. It changes daily, and every new pumpkin, squash, melon, and cucumber makes me smile. There are quite a few pickling cucumbers just starting to form, which should make Bubby happy--he's the one who wanted me to grow pickles, and it's looking like we might actually have enough to make at least some.